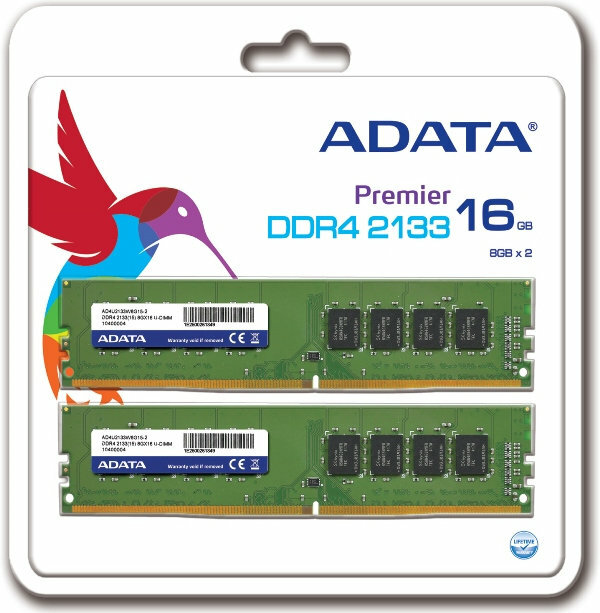 ADATA recently launched two new DDR4 memory modules in line with the release of the new X99 systems, the ADATA XPG Z1 DDR4 and ADATA Premier DDR4 2133 U-DIMM. The XPG Z1 DDR4 is an overclocking memory that is geared towards the PC enthusiasts and overclockers. Meanwhile the Premier DDR4 2133 is your typical DDR4 memory that is geared towards the general X99 users. Both memory modules support the latest Intel Haswell-E processors and Intel X99 platforms for extreme performance. Both DDR4 DIMMs provide a faster starting clock speeds at lower voltages leaving the DDR3 memory behind. Check out the rest of its features and specifications below. With speeds of up to 2800MHz, timings of CL 17-17-17 and transfer bandwidth reaching 22GB/s, the ADATA XPG Z1 DDR4 provides improved efficiency of data transfer. Only 1.2V is required to achieve high clock frequency of 2800MHz for overclockers. In addition, the SPD (Serial Presence Detect) of the XPG Z1 allows direct application without changing settings in the BIOS, facilitating usage and system stability. The ADATA XPG Z1 DDR4 features a jet wing-inspired design with carbon texture used for race cars, symbolizing the pursuit of extreme performance. Thanks to the unique Thermal Conductive Technology and 10-layer PCBs with 2oz copper, the chips in XPG Z1 can contact with the heat sinks directly, ensuring IC and PCB operate in an environment of equal temperature, as well as reduce electric resistance and consume less power, which greatly enhances the quality of signal transfer. With speeds of up to 2133MHz and a transfer bandwidth reaching 17GB/s, the Premier DDR4 2133 Unbuffered DIMM provides greater efficiency of data transfer than previous generations of DRAM. Compare to DDR3, the new DDR4 2133 Unbuffered DIMM can save 20% of the power, making it an environmentally friendly component. As of today, ADATA hasn’t disclosed the manufacturer’s suggested retail prices for the XPG Z1 and Premier 2133 DDR4 memory modules. I’ll try to post an update once prices for these DDR4 are disclosed and/or when they become available to order online.